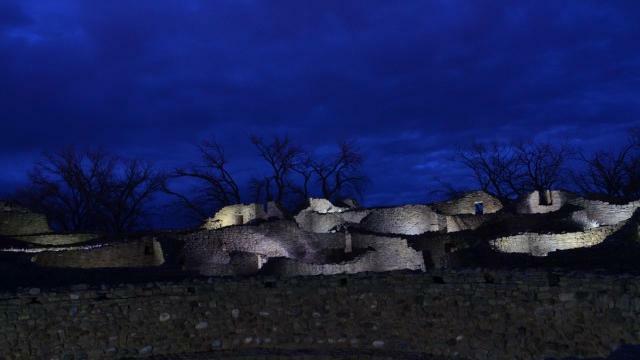 Every December, the 900-year-old adobe-brick walls of Aztec Ruins National Monument are lit up for the holidays. Here's how to visit. New Mexico’s Aztec Ruins National Monument is not as well known as the state’s Chaco Culture National Historic Park, but it’s more easily accessible and has just as much Native American cultural history to share. And every December, Aztec Ruins’ 900-year-old masonry walls are lit up for the holidays. Established by the Ancestral Pueblo in the 12th century and thought to be used as a ceremonial center, Aztec Ruins’ more than 400 rooms—some with intact wood-beam ceilings—are a UNESCO World Heritage Site and one of three historically significant sites in the Four Corners area. Aztec Ruins is located in the cottonwood-shaded city of Aztec, about 15 miles south of the Colorado/New Mexico border; Durango, Colorado, is about 35 miles north, and Farmington, New Mexico is 15 miles southwest. Despite its name, it wasn’t actually built by the Aztecs of Mexico. When you visit, view the video Aztec Ruins: Footprints of the Past to gain an understanding of the ancestral Pueblo people and how Aztec Ruins fits in with a larger Southwest network of ancient stone structures, ceremonial centers, and trade routes. The site is open year-round, and ranger-led tours are held during peak season (usually Memorial Day through Labor Day). Trail maps lead you on a self-guided tour the rest of the year, and there are some impressive 900-year-old artifacts and treasures to see—though most of the artifacts excavated from the area are housed at the American Museum of Natural History in New York and the Western Archeological Conservation Center in Tucson. December’s Evening of LightsEvery holiday season, Aztec Ruins is lit up for just one night. For 2015, that special Evening of Lights is scheduled for Thursday, December 10, from 6 p.m. to 8 p.m. Visitors will enjoy the magical glow of the masonry walls, the lantern display in the Aztec West Great House, and cultural demonstrations inside the visitor center. The event is free—and includes site admission, cookies, and hot cocoa. Know before you goAztec Ruins ($5 entry fee) is in northwest New Mexico on four-lane U.S. 550, about 15 miles south of the Colorado/New Mexico border and 180 miles north of Albuquerque. Learn more about the area: aztecnm.com; there are lodging options on that site and a fairly new Microtel Inn and Suites nearby.